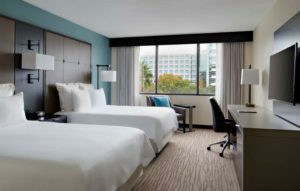 A discounted rate of $165.00 per night + tax will be available at the Houston Marriott Westchase. The deadline to book at this rate is Saturday, September 15, 2018. You can book online or call the Houston Marriot Westchase Directly at (713) 978-7400 and mention “OilComm 2018” for your discounted rate. Contact Jessica Davis at jdavis@accessintel.com with any questions or concerns. The registration desk will be located on the first floor of the Marriott Westchase in Grand Pavilion Foyer. Please refer to our schedule of events badge for detailed registration hours. We have been made aware that certain companies are targeting OilComm and FleetComm exhibitors to secure your rooms at the Houston Marriott Westchase through them. Please note that these groups are in no way affiliated with OilComm and FleetComm and beware of their false claims of having access to hotel rooms in the official OilComm and FleetComm room block. You will receive information directly from OilComm and FleetComm regarding any legitimate housing updates. United Airlines: Save an additional 3% by booking your own airfare online at www.united.com. Choose your flight times and access your discount by inserting ZE2A981123 in the Offer Code box. Or call your travel professional or United Meetings at (800) 426-1122 FREE for reservations. Refer to Z Code: ZE2A and Agreement Code: 981123. (A $25 service fee will be collected for all tickets issued through United Meetings Reservation Desk). Delta Airlines (save up to 10%): Reservations and ticketing is available via www.delta.com. When booking online, select Book a Trip, click on More Search Options and enter the meeting code, NMQKL, in the box provided on the Search Flight page. Reservations may also be made by calling Delta Meeting reservations at (800) 328-1111 Monday – Friday from 7 a.m. – 7 p.m. CDT. Additional fees may apply. Rio Ranch – Charming steakhouse inside the Hilton hotel with ranch-house decor & a man-made creek off the patio. El Tiempo Cantina – Lively branch of a family-run cantina chain known for potent margaritas & hearty Tex-Mex dishes. Himalaya Restaurant – Pakistani and Indian Cuisine with deep Texas roots featured on Anthony Bourdain’s Parts Unknown. Chengdu Taste – Not great atmosphere for entertaining clients, but it’s been referenced as “The best Sichuan restaurant in America” at times. Ohn Korean Eatery – Clubby, neon-lit restaurant serving Korean comfort food alongside soju & makgeolli rice wine. Crawfish & Noodles – Whenever world-renown David Chang visits Houston, he eats here. The Original Marini’s Empanada House – The Original Argentinian-Style Empanada House, featured on Guy Fieri’s Diners, Drive-Ins and Dives. Torchy’s Tacos – Casual spot, but daaaaarn good tacos! Looking for more tips on where to hang in Houston while you’re in town for OilComm? Email Mike Conti, Group Marketing Director, and he’ll give you more ideas!